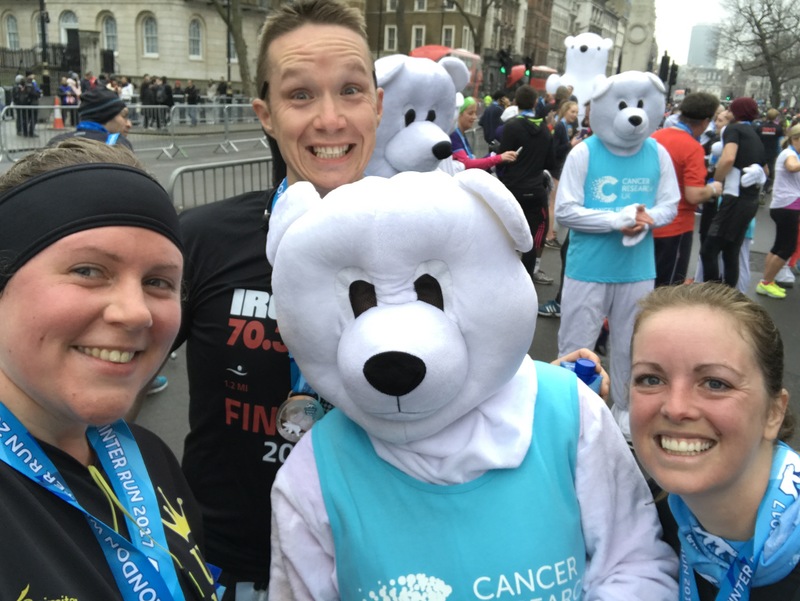 Yesterday was exactly 3 weeks till Tokyo Marathon, and after running over 25miles in training during the week my Sunday run was a bit different! 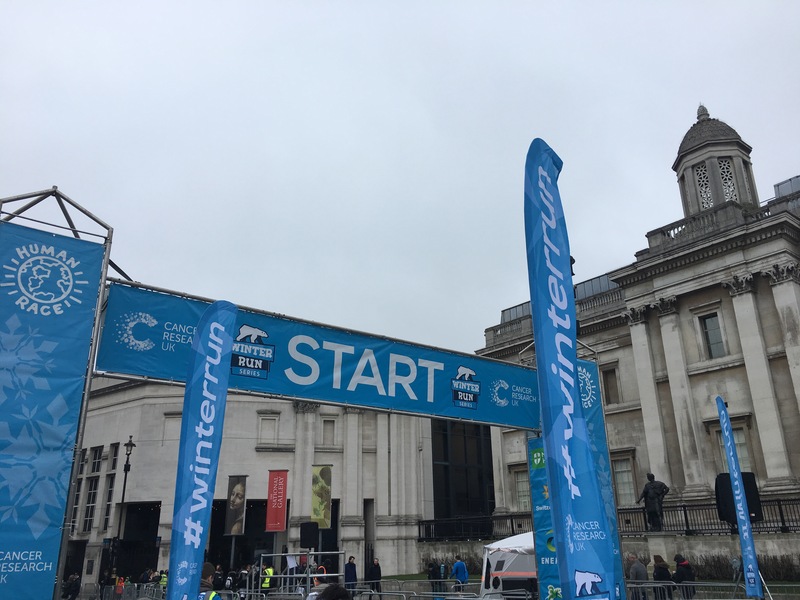 I ran the London Winter Run, organised by Human Race Events as a fundraising event for Cancer Research UK this event had over 16,000 participants!! I headed to the event with 2 of my friends Brett and Lisa, we dropped off our bags and headed to the start. I have to say bag drop was a really easy process and it’s pretty essential at a winter race as you need to be able to drop off warm kit to put on when you finish. It was a rolling start with groups heading off every few minutes to make sure the course didn’t get too congested, we were lucky enough to head off with the first wave and after a slightly steady start it soon became clear the course would be pretty quick. 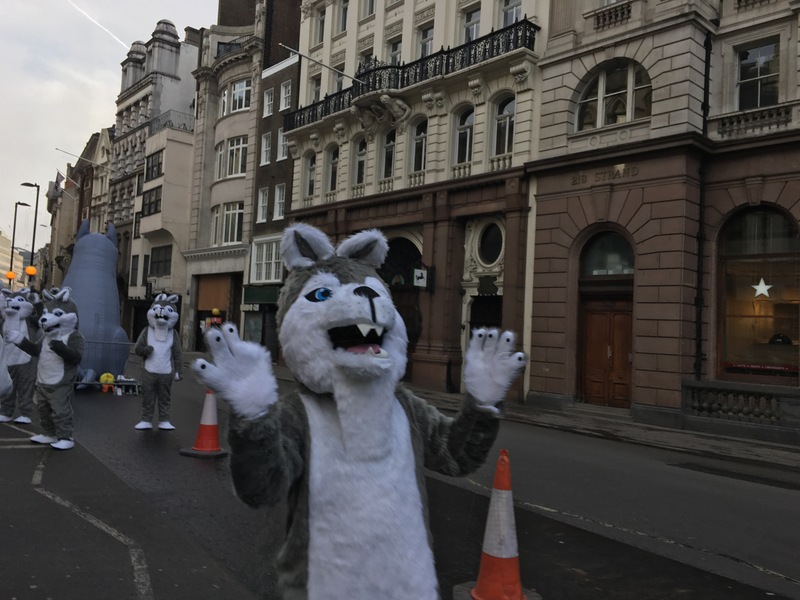 There were characters along the way to cheer on and high five the runners, snowmen, polar bears, and if anyone was wondering why there appear to have been so many PB’s on this course it could have been due to the runners trying to escape the scary huskies?! This one tried to eat me at 2km!!! Maybe it thought I should have been putting more effort in and not running with my phone out taking pictures? 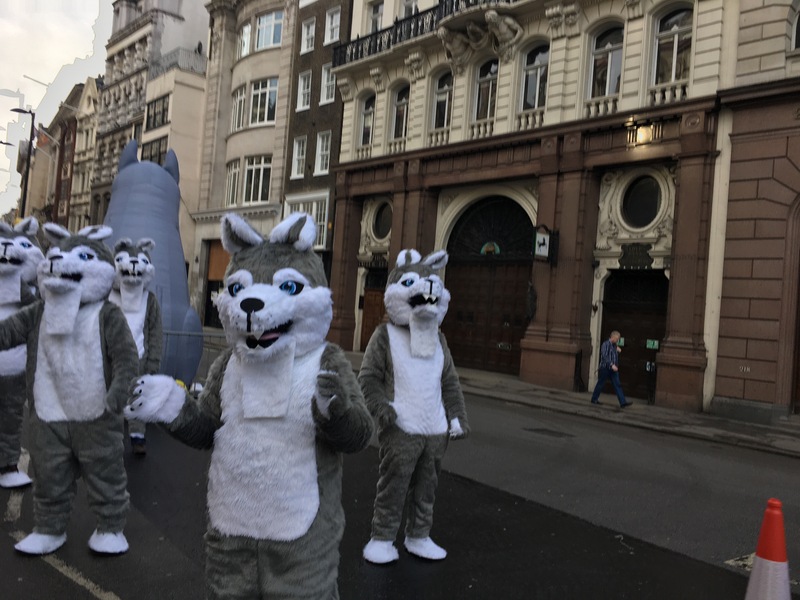 But seriously the costume animals along the way were great and really encouraging! Here are some looking less frightening! 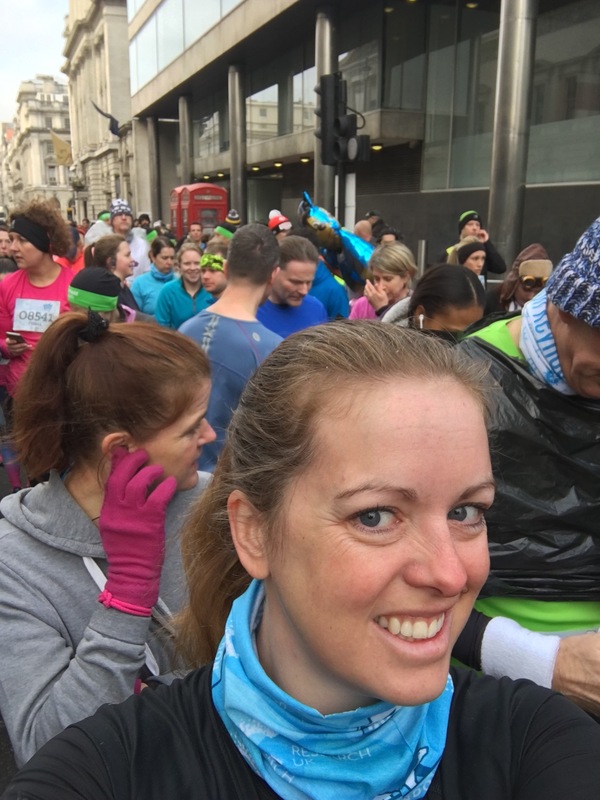 The course wound round central London, passing St Paul’s, and weaving around the Bank area, including running behind the Bank of England, there was lots to look at and I hadn’t studied the course map so it was quite nice to just not know where I was going and follow the crowd. There was a water station at 5km (much needed for me as I was running with a bit more effort than usual). Then it was the last stretch. All Km’s were marked and soon I was into the final 2, willing my legs to go just that little bit faster and get to the finish! The finish line seemed a little further than 10km, my watch clocked 6.4miles but that’s ok! Although I was starting to wonder where the finish was as I ran down the final slope before turning the corner and seeing it. 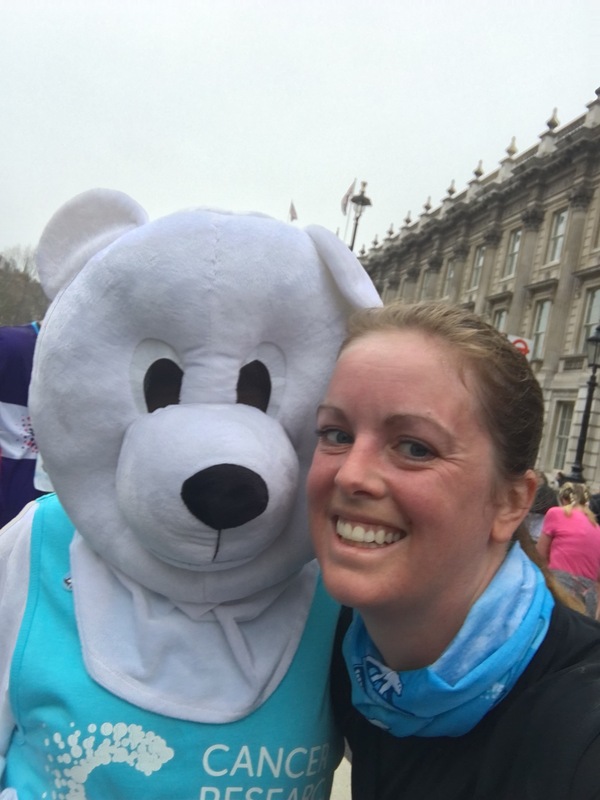 There were polar bears (dressed up characters) at the finish line providing well earned hugs! And they were very happy to pose for selfies! That picture is in no way filtered I am not sure why I wasn’t redder in the face than that??! I had run I promise! 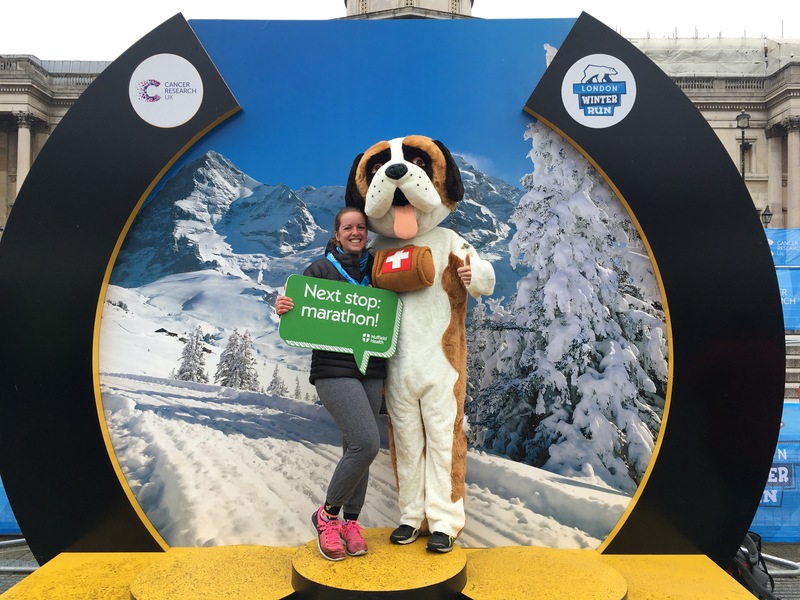 I met Brett just past the finish line and then we found Lisa and headed to have our picture done with a cuddly St Bernard (firstly a dressed up one and then a real one)! I would totally recommend this race! Everyone I know who did it had a great time and a lot of people (including Brett and Lisa) managed amazing PB’s! So if you are in London next year get involved. A great race for a fantastic cause! Another race done, a total of 32.5miles run in the last week! And I’m super happy with my efforts yesterday after a tough week of training. I’m going to try and factor in some rest days this week with a few short recovery runs and then head out for a long run at the weekend. 20 days till Tokyo! !